Ryanair management confirmed on Friday that it would break with its longstanding policy and give pilot unions recognition as official organisations. A SPOKESPERSON FOR the union representing Ryanair pilots has said that it will take airline up on an offer to meet on Tuesday, just a day before planned strike action. Irish Ryanair pilots who are members of Ialpa – which is part of the Impact trade union – announced earlier in the week that they would be holding a strike this Wednesday over the issue of union recognition and other employee conditions. Yesterday, an Impact spokesperson told RTÉ News that union officials wanted to meet with the airline management before the strike was called off. Ryanair said that it could meet with Impact officials on Tuesday. Today, speaking to Today FM’s Neil Delamere’s Sunday Best show, Impact spokesperson Niall Shanahan said that it would be “happy to do that”, but warned against premature hopes of success. 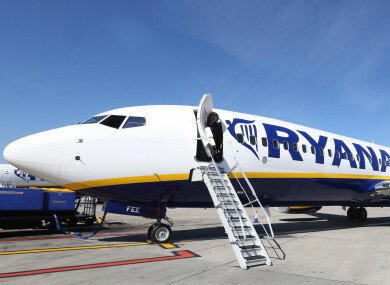 “We indicated to Ryanair that we were happy to meet them on Wednesday, but we would not be in a position to consider suspending the scheduled industrial action until we met them,” Impact spokesman Niall Shanahan told Today FM’s Neil Delamere. “They suggested a meeting on Tuesday evening, and again we are happy to do that, but similarly, we are not in a position to consider the stages of the industrial action until after we’ve met them because then we are just in a much better position to ensure the substance of the Ryanair offer. “The earlier we can meet the better,” he added, saying the “devil was in the detail” of the deal. Ryanair has called for the union to call off the proposed action on Wednesday. It said that the threat of strike was “causing unnecessary concern and worry for thousands of Ryanair customers travelling home during Christmas week”. Email “Ryanair and pilot's union to meet on Tuesday, just one day ahead of proposed strike”. Feedback on “Ryanair and pilot's union to meet on Tuesday, just one day ahead of proposed strike”.